There’s so much excitement and adventure when you have your own recreational vehicle. It allows you to explore beyond the bubble you live in, and almost always comes with memorable experiences. The RV is your home on wheels that makes each day in it unique and special. And with all that discovery, it will be frequent to camp out in the natural wilderness where there is no shore power or utility connection to hook up your rig. That’s why your RV cannot be more fun when you don’t have a dedicated generator and a reliable one at that. An RV generator should perhaps be a fixture in any camper that is one’s second home. As such, it would contain many modern conveniences on the road that can only operate with a steady source of power over a period of time. However, most of you who are new to the RV game might have several misconceptions about purchasing a generator. One would be its price, which is often a common consideration whenever you will buy a product. Another is the myriad of options out there and you don’t know jack about the subject to understand the specs each item would have. Worry no more because I will discuss at length everything you need to learn about RV generators. This way, you will eventually make an informed decision to purchase the right one for you. I have chosen the following different RV generators that even most buyers have taken to purchasing because of their quality, performance, among other considerations. You will notice that our list is dominated by Champion generators. Runners up include Westinghouse, Honda, DuroMax, and WEN products. Let’s get right to each one of them. The best generator from its manufacturer using true sine wave inverter technology is the Champion 3100W portable inverter generator. With 2800 continuous wattage, it provides enough power to onboard appliances up to 8 hours at a time. The true sine-wave inverter operation produces smooth waveform power to achieve the highest performance of your electrical devices. 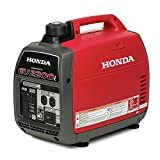 This generator is not only RV-enabled but also RV-ready so you practically just have to find a spot in your rig, make those simple connections and they’re ready to go. It’s economy mode promotes fuel conservation on reduced loads. It is equipped with an oil sensor that shuts off the unit when oil is low in quantity. The power flow on this inverter remains consistent such that it can handle even the most sensitive electronics. If there’s one thing that I wish could be better with this product is its weight, which is rather heavy at almost 100 pounds. 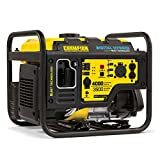 Comes slightly more powerful than its 3100W sibling, the Champion 3500-Watt RV-ready Portable Generator is capable of 4000 starting wattage and settles with 3500 watts when running appliances. The rugged build boasts of a volt guard – a surge protector built into the unit that prevents voltage spikes and overloads. One remarkable feature of this portable generator is the use of the so-called Cold Start technology. This means you can start up your unit quickly, even during winter. The additional Intelli-gauge provides monitoring systems for voltage, frequency, and the unit’s running hours, thereby allowing tracking of maintenance. This product has a fuel tank that can hold less than 4 gallons of gasoline. A full tank load can be consumed for 12 hours given a 50 percent load. Essentials such as fridge, lights, fan, etc. can be powered on without a hitch. It is said, however, that the tank opening can only accommodate small refills each time. The noise level of 68 decibels from a distance of 23 feet is similar to a sound of a running vacuum cleaner, which can be highly distracting. The Champion 3800-watt Dual Fuel Portable Generator is a versatile and convenient product with its capacity to use fuel of the two different types namely, gasoline and LPG. With a full tank using gas, your rated appliances can run up to 9 hours, and 1.5 hours longer when liquid propane is used. This unit starts up with 4750 watts and levels out at 3800 watts with electrical devices in use. Just like the 3500W Champion variant, this generator can be powered on immediately in cold climates with its Cold Start technology, has the same noise level at 68 decibels with a 23-foot distance, and a volt guard to protect from surges and overloading. It comes with multiple outlets and a foldaway handle for easy storage. The inclusive tires will even make towing it a breeze. Some buyers, however, have found its noise quite high when its about 15 feet away, which others should take note of when considering a purchase of this generator. This gasoline-powered inverter generator boasts of being one of the most innovative in the market. Its Quiet Digital Hybrid means it produces 50 percent less noise. It is lighter than traditional 3500-watt generators by 20 percent with its efficient mechanical build. As such, it only weighs a little over than 80 pounds. In other words, it is smaller, lighter, quieter, and just a lot better than most. The Champion 4000W Open Frame has a durable 224cc engine capable of 4000 starting watts and 3500 continuous watts. With the extended run time, you can max it to 17 hours with a 25 percent load, and a full tank of 2.9 gallons. Its Quick Touch panel provides quick access to the controls. The Eco mode can also be used to decrease the electrical load, which in turn produces a quieter sound. The additional kit includes parallel connectivity parts that allow the use of two inverters or hybrids with up to 2800 watts each. 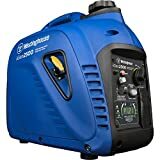 The best generator model from Westinghouse, the 2500W inverter generator has 2500 starting watts and 2200 continuous watts, making it sufficient to deliver power to your rig appliances. This lightweight 48-pounder unit makes it easy to transport and carry by just one person. It promises to be super quiet, to the tune of 52 decibels, so it is not distracting to campers who just want to de-stress from the city life. At a full tank load of 1 gallon, it can run between 6 and 7 hours depending on usage. The control panel has an LED display which shows fuel level, output voltage, run time, and load percentage in use. Should you wish to increase the 2200-watt rated running capacity, you can hook up an additional generator using parallel connectivity. This way you can have a combined peak load of 5000 watts. There’s only a minor hitch for this unit, which is the tight oil tank. It will prompt you to take out the engine cover every time you need to access it. 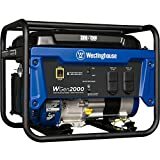 The Westinghouse WGen2000 Portable Generator is quite impressive with its compact, yet durable construction. The thicker steel components such as the 1-inch frame may make it heavy at under 100 pounds. This conventional generator starts up at 2500 watts and runs down to 2000 watts. As such, it is ideal for light to moderate power requirements for appliances such as a TV, ref, fan, PC, among others. With a bigger 4-gallon fuel tank, it can last you up to 20 hours at 50 percent load. This is a rather amazing feat considering it does not have an economy mode or any fuel-saving scheme. What’s more, is its highly competitive selling price at below 300 dollars as of this writing. You have to remember to use additional Uninterrupted Power Supply or UPS if you intend to run your computer and other sensitive equipment. This way, the required pure sine wave will be delivered by the internal inverter of the UPS. One of Honda’s more recent offerings in their inverter generator line, the exterior of the EU2200i looks pretty much its popular predecessor. But of course, it comes with more updated characteristics. First one is obvious, which is the increased wattage from 2000 watts to 2200 watts. This new variant has a continuous output of 1800 watts compared to 1600 running watts of the older model. To be honest, this 10 percent increase isn’t much, but it’s still good nonetheless. Add to the fact that it weighs just about the same in spite of the higher power capacity. But the noise level is noticeably much lower with this one and at the same time, it is more fuel-efficient. The Honda EU2200i has its own economy mode called Eco-Throttle system that can stretch run time to 8 hours at full tank, depending on the load that is. It even has a mechanical decompressor system that requires less power during engine ignition. The oil tank has a larger opening, longer spout and bigger drain gutter to facilitate maintenance. And because this is a Honda product, its topnotch quality has a corresponding price tag that can be too rich for someone’s blood. Despite that, I would say that this is still worth its high cost. 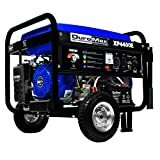 The DuroMax XP4400E is a powerful conventional generator that can handle loads of up to 3500 watts and a starting output of 4400 watts. This is perfect not only for your RV, but also as a backup for your home electricity in case of a power outage. The wheel kit has an adjustable handle that makes for hassle-free transport. You will appreciate that despite the high power capacity, you can purchase this unit at a reasonable price. At 50 percent load, you can expect a run time of 8 hours with a full tank. However, its noise of almost 70 decibels can be bothersome. The 1-year limited warranty is also quite disappointing when others have been offering their units with a guarantee of three years. Other buyers have also complained about its wavering performance when utilized at more than 3000 running watts. 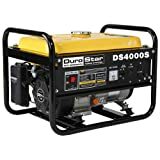 Rated for 3300 continuous watts and surge output of 4000 watts, the DuroStar DS4000S offers great value for your money that you can consider for your appliance use in your RV and as a backup for your home electricity. If its heavy weight, noisy operation, and lack of wheels for transport do not bother you as much, this conventional generator will deliver the most important aspect, which is, power for your off-grid lifestyle. The WEN 56200i inverter generator is a great choice for those who prefer a “whisper-quiet” operation that produces cleaner energy. With is pure sine wave replication, you can run the most sensitive electronics like computers and mobile phones. You will even love its lightweight portability and affordable pricing compared to branded inverter units. You may somehow be familiar with a generator, probably, you have it as a backup power source for your home. Regardless of where you use it for, a generator will make sure you will still get some comfort and entertainment when you can’t have a wired power connection. Thanks to the RV generator, gone are the days of rough camping, where you often find yourself using a tent or a sleeping bag to stargaze during nighttime, with a little help of a few food items plus an emergency kit. Those were all just the things you can do after a whole day of hiking and exploration. Imagine the things you can do in your RV since then. You can watch videos, take a hot shower, cook your meals, and relax in a cool climate inside while camped out in the middle of nowhere. The RV generator is used either as a direct power supplier for 120-volt AC appliances or as a charger for your vehicle’s house batteries. But what really is an RV generator? To define it in the context of electricity, a generator is a tool that transforms a given form of energy into electric power. The energy source could be gasoline, diesel or propane. The resulting fuel combustion powers up the generator motor for it to keep turning to produce electricity. So how exactly does a generator work? It’s important to understand this aspect before you make a decision to buy one. First and foremost, you would want something that will power up quickly and easily. Aside from that, it should run smoothly and efficiently. I’ll go through four essential components of a generator, which are the fueled motor, fuel setup, starter motor, and electric generator. While there are a variety of motor builds, there’s basically a simple and the complex type. Let’s use the cheaper simple gas-powered motor as an example. It would have dual cylinders that come with a corresponding piston attached to the crankshaft. These cylinders would also have input ports for air and fuel such that when one is ignited, the other will, too. There’s the exhaust port included in this mechanical setup. This will ensure the ignition and exhaustion systems are in place. For diesel-powered generators, combustion takes place with diesel fuel compression because they don’t have a spark plug that typically initiates the engine to start. As the generator can only be powered with fuel or some motive energy, it will have its fuel tank. 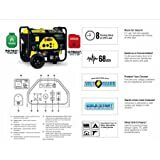 In the case of a portable generator (or genset), it will have a dedicated tank, whereas a built-in generator will source its fuel from the main tank of the vehicle. Relying on gravity, gasoline is fed to the carburetor where it is mixed with oxygen. This is then injected into the cylinders that get ignited by a spark plug. As such, an explosion of sorts takes place, which forces the piston to open up. This will move the motor shaft based on mechanical timing. In the case of generators that use diesel fuel, instead of a carburetor, the fuel is introduced directly to the cylinder through a fuel injection system. The same effect happens with oxygen and fuel mixture as in gas-powered generators, with the exception of a spark plug and carburetor which a diesel engine wouldn’t have. The ignition has taken place when your motor starts to turn continuously with the cylinders repeatedly undergoing firing cycles. You must know that once the motor is up and running, it becomes self-reliant, which means, no succeeding starter processes are required. Comparing the use of gasoline and diesel, the latter entails a higher current than the former to get its motor turning. You see, the starter motor of your generator requires voltage which is supplied by your RV house batteries. This causes a form of compression on the fuel that turns into combustion, making your motor turn with the appropriate high speed. This is actually what you call the part that produces the electricity, an electric power generator. This is how it works in a nutshell. A wire coil would spin in the opening of an outer coil. If you attach voltage to the wire coil and connect a charger to its ends, you will then acquire AC power from the wires. As mentioned earlier, RV generators are powered by fuel sources which may vary from gasoline to diesel and propane. There are also different setups made to get the most out of generator usage. It is often that RV users get more than one generator as either backup or supplement to the main unit. This way, you create less strain on your main power supply and prevent overuse as well. A hybrid install is not an uncommon option, which would usually feature a generator as the main power source and a solar panel as a backup. The solar panels are placed on the RV roof that powers a fairly small generator, which will then supply energy to your light appliances. This hybrid setup is such that you allot the main unit to power your major devices such as the A/C. You can also consider getting a separate portable genset, which is also called a camping generator, to cater to specific electrical needs. Let’s delve further into the different types of an RV generator according to the fuel source. It should make sense when your actual towing vehicle runs on diesel, you should also get a generator that can be powered by the same type of fuel. As such, most Class A motorhomes use the diesel generator. Diesel produces more power than liquid propane, making the diesel unit the most powerful type of generator. It burns much cleaner than gas. Furthermore, it’s not volatile and is actually quite safe to store. One disadvantage of diesel-powered generators is their noise. They usually emit louder, distracting sounds because they hold heavy components. This extra weight and its strong fuel smell may not appeal to those who have limited RV weight capacity and high odor sensitivity. While being the most expensive RV generator type, the diesel-fueled generator remains a formidable choice, especially when you are looking at using many applications in your rig. The gasoline fuel is the most widely available fuel source in the country. You are almost guaranteed to find an accessible gas station every few miles. So you might want to take note of this when choosing which type of generator you want for your RV. But unlike diesel, gasoline can burn like crazy as it is highly flammable. As such, you will consume more gas than when you use the other 2 fuel sources. The term gas guzzler is a brief way to describe it. The good thing however is, you can just store an extra amount in a separate container as a backup. In addition, gasoline is capable of providing a decent amount of power to a number of your RV appliances for much longer. In terms of caring for the environment, this fuel source won’t fare as well as liquid propane. In fact, it is “dirtier” in a sense, given that it has a lot of impurities in it that impact its shelf life. That’s why it ends up being consumed faster, but if not, they usually expire too soon. On this note, you must remember to empty out your gas generator before storing it so that it won’t clog the unit parts. Nonetheless, a gas generator remains relatively safe for use for as long as you know its proper care. For the environmentally conscious buyer, an LPG powered generator might be your only choice. That’s because liquid propane has much cleaner emissions. It also boasts of longer shelf life, thereby you would not be wasting any bit, let alone replacing unused portions. What’s more, is that this type of generator is usually the cheapest of the bunch. There is quite a setback to fully choosing the propane type – it has time limitations because you can only store as much as what will fit in the propane tank. And whatever you have in the tank actually burns faster. This won’t be viable for longer periods of usage, not if you’re a frequent off gridder. If you have this generator, you will need to monitor your power consumption every now and then. And when you factor in the scenario of running out of its supply, you will be bummed to realize that LPG is not readily available in gas stations. That could leave your appliances, including yourself, paralyzed in a way without the ability to power on your creature comforts. Add to that the less power it generates compared to gas and diesel, will make you think twice. Depends on how you love Mother Earth so much, you might want to think hard and make sure you have little power needs when RVing before you consider buying a propane-powered generator. It may be cheaper, but it is consumed quickly as a tradeoff. You might just find yourself refilling too often, thereby spending more dollars in the long run. Now you know the basics of RV generators, check out the succeeding factors that you must take into consideration before zeroing in on your pick. Getting the correct power output takes precedence over other factors when considering a generator for your RV. A generator will only work to your advantage if it is able to meet the power demands of your electrical appliances. If your camper has an A/C unit, match its wattage with your generator. And because this cooling device consumes power the most, you can use it as a reference point. You need to note two things, though – surge and continuous watts. Compare it to a sprinter who has an upstart from the beginning of the race, who will then pace himself to a fast, but consistent speed to maintain his distance. The same principle pretty much applies to generators such that when you power on your A/C, there is an electricity surge at the start and “relaxes”afterward. It continues to run smoothly until power off. So to be specific, the wattage of your generator should then match or exceed your AC’s starting wattage. If that is between 2500 and 2700, then you can pick somewhere from 2800 to 3000 watts. If you plan to run multiple appliances simultaneously, sum up all their power watts in order to determine the right size of your generator. You can also consider buying more than one unit and assign each accordingly to your devices. So now you have matched your power requirements by using the starting wattage of your equipment as a reference to the right wattage of your generator. You must also know that generators can use different technologies, which can either be conventional or inverter. A conventional generator is what you often see in other RVs and homes as they have been around for a long time. It uses a fuel source to power its motor. This motor will then run at a constant speed at about 3600 RPM in order to generate the required current. In case of an RPM fluctuation, so will the output frequency. Inverter generators, on the other hand, are more advanced models. What makes them better is that they adjust the RPM speed depending on your electrical load. This flexibility in speed enables them to provide a much more stable electricity flow. When AC output is stabilized, it prevents messing up the device memory of highly sensitive equipment. This is somewhat similar to what a surge protector does to a power grid. Also, it makes it possible to use more than 1 unit using parallel operation, which the conventional generator can’t do. While an inverter generator may be a clear winner over the conventional type, you shouldn’t dismiss the latter entirely. That is if you have a limited budget, minimal power needs, and wouldn’t mind the noise. As for the actual size of your generator, just make sure that if you’re buying more power capacity, that you have a corresponding space in your RV for it. High-power generators are much larger in size. Especially if you plan to buy more than one generator, which is possible with the parallel connection so that you can accommodate more electrical devices. More often, portability is one of those things that buyers would look for in a generator. A portable unit makes it a versatile one because it’s easier to transport and use in other applications such as providing emergency power to a home. If you have a bigger trailer such as Class A and fifth wheel types, a built-in generator is usually available, which is much bigger. You won’t need to worry about making room for such. A conventional generator has a motor with an internal combustion mechanism, given its explosions from the mixture of fuel and air. This kinetic energy would then emit noises that can be distracting. So the question is, how much noise can you tolerate coming from your generator? Each individual’s sensitivity to noise is different. Maybe you are ok with it, but your neighbors feel otherwise. Aside from that, there are private campgrounds that have noise policies. A 90-decibel noise output can be truly annoying and can, in fact, be a health hazard. When the noise level of your generator is less than 60 decibels, it can be considered a quiet unit as it is pretty much equivalent to a normal conversation. Take note that even the quietest and most expensive generator will still emit some noise, albeit at a tolerable level as a result of electricity production. When noise will be an issue, an inverter generator is your best bet to a more peaceful space. Generally, the larger generators tend to produce more noise than their smaller versions. Also, if you use more than one generator, their combined operations will definitely make them noisier. Alternatively, if you are the only one being bothered by the noise or at least the occupants of the RV, then you can perhaps consider soundproofing your walls and ceiling to muffle if not eliminate the noise you can hear from an operating generator. For long camping trips, a portable generator might not supply you with sufficient power without spare fuel on hand. That’s because a small unit would also have a small fuel tank. As such, you should also consider the fuel economy of your generator. This is important so that when it is in use at night, your sleep will not be interrupted just to refuel your unit. The efficiency of your fuel will vary by type, model and brand. Needless to say, an inverter generator is more fuel-efficient than a conventional one. This is one of the reasons that this is the ultimate choice when it comes to generators. To give you an illustration, an inverter-type will run at full load capacity of 1800 watts for 3.5 hours. It will be stretched for a little over than 8 hours in fuel-save mode by generating only 25 percent of its full load. This means you can have about 450 watts that can accommodate your fridge, fan, and crockpot. When you want to calculate your fuel requirements, let’s use the preceding example. If you use an A/C for 24 hours, divide its running wattage (800W) from the starting wattage (1600W). You will then arrive at 50% load. Assuming the fuel tank has a 1-gallon capacity, you will need to refill it after 7 hours to continue operating it. This is where conventional generators will win without a doubt, most especially the gas-powered ones. You must note that prices of inverter types have become more competitive recently, but their sophisticated electronics and design would still require them to have a higher price point. Expect to shell out up to 900 dollars for a compact and quiet inverter technology. Yes, there are just so many things to consider to achieve the right generator purchase. I have discussed with you earlier the factors that can influence your decision involving the features of the generator. Let’s switch it up this time and take into consideration external factors. I’ll start with your RV. What type of fuel does your RV run on- diesel or gasoline? If it’s diesel, I would assume that there are many appliances in your rig. As such, choose the same type of fuel source for your generator as well. In short, diesel RV = diesel generator. Midsize RVs would then require an average power supply. A gasoline-powered generator can do the job just fine. And if you won’t be using electrical devices for the most part, a propane generator might be enough for you. Just remember to take note of the total power wattage based on the regularity of usage, and find the generator variant that can meet or exceed this requirement. Should you opt for a lower variant of a generator, don’t forget to adjust your usage accordingly. Having a 1500-watt generator may only allow an AC unit to be operated at a time. Or maybe two or three minor electrical equipment, which means you won’t be able to turn on your AC alongside it. Anyhow, for as long as you are conscious with this, this cost-efficient option may still work for you. It is not uncommon to see RVs on the road nowadays, with many people joining the hipster RV bandwagon. Those with deeper pockets can buy these fabulous motorhomes that can practically serve as a primary residence, what with all the luxury appliances that are present inside. Electronic gadgets, kitchen amenities, air conditioning system, etc. are just some of the modern facilities you are bound to see in a camper. And what good are these if you don’t have a heavy-duty and powerful generator. If you could afford a luxury coach, most likely you will go for premium generator brands to supply your electrical needs with clean and sufficient power. Nonetheless, being a good brand does not necessarily mean breaking the bank all the time. Here are three of the most reliable brands of generators namely: Champion, Westinghouse, and Honda. This company is no doubt the industry leader with its many years of experience, not to mention its excellent customer service. Their products are engineered in the US and other countries worldwide. They boast of having sold more than 2.5 million generators in the US alone. Champion generators are known for being relatively quiet, dependable and more importantly, inexpensive, particularly their 3500 variant. This model can be fueled by either propane, or gas. Travel trailers and the like will appreciate the reduced noise levels of Champion generators. What’s more, there is a much less voltage drop during their load application. They have small portable models as well as built-in types, with a carrying handle that makes for easy transport. Westinghouse is another trusted brand that’s also a popular provider of other home appliances. It started in 1865 with developing and producing steam innovation products, which was a revolutionary achievement at the time. Today, their generators are known to be high quality and portable, making them convenient to transport for use in other applications. Their sturdy construction is evident on their sleeves made of cast iron, which is a feature in many of their generator models. This provides durable protection on the fuel tank and the unit as a whole. They also come in various power capacities, made more attractive by their standard three-year warranty. Honda is not only one of the biggest brands in the automotive business, their generators are also worthy of praise that appeal to many RV owners. Reliability is one of the key features of their generators, just like what their cars are known for. Definitely, their reputation has preceded them, and the great thing is, they actually do deliver. This generator brand comes highly recommended for campers who cannot go offline after a day of hiking in the mountains. It is widely available, although it may not be considered as affordable, but you still get value for your money given its quality as proven by many individual performance tests. Their portable models are thus highly favored. One of the many benefits you can get with an RV generator is obviously your ability to use your electrical appliances on the road, or when your RV is at a camping ground that has no power hookup. An RV generator is capable of providing a continuous power supply to your devices so that you can still work on your projects using your laptop, play video games, refrigerate food items to keep them from spoiling, or use your A/C under hot temperatures. In fact, you can even run a vacuum cleaner to maintain your camper interiors, or work with power tools whenever you have to. The operation of such complex appliances during a camping trip may not be possible if you don’t have an RV generator. When you go off the grid, it doesn’t mean you have to sacrifice your creature comforts altogether. Thanks to the portable generator (and some fuel), you can have a nature day trip, and come back to your RV to watch TV before calling it a night. You can even park anywhere without worries of not having a power supply. With an RV generator, you don’t have to fear it not working just because you don’t have enough sun, or stormy weather could be brewing, which would affect the functionality of solar panels. For as long as you have sufficient fuel with you, you can be assured of its continued supply. In fact, it can even work hand in hand with your solar energy to provide more power in case you want to use many devices simultaneously in your rig. You must know that when you have an RV generator, the portable kind in particular, it can also serve other purposes such as providing backup power for your home during a power outage. No need to buy a separate genset. This way, you’re able to get a lot of other uses from your RV generator, especially when your camper is in storage, or not in use. While buying an RV generator can cost you depending on the brand and specs, you can actually make some savings along the way. One is, you don’t have to pay extra for specific RV parking slots, or those designated areas with an electrical grid. You can totally go dry camping for as long as you have enough water supply and portable tank to rely on. Yes, you can go out there, fill your lungs with fresh air and be one with nature. You can de-stress and leave your headaches in the city. With an RV generator, you can retire to your rig and sleep comfortably with your turned on A/C, and have a cup of freshly-brewed Joe the following morning. This kind of security that you feel at your actual home can also be felt when you are hunkered down in your RV, with functioning appliances because of your generator. Have a look at your trailer interior and find the best area where you can store your generator. It should be a place which can provide steady support to your unit to prevent it from falling or breaking. Check if your RV has a dedicated generator tray where you can simply install it. If there’s none, you can build one at a designated spot using panels, brackets, and clamps. When it is not in use, the generator should be stored in a safe, cool and dry area. Moisture is an electrical device’s enemy during storage so make sure it’s nowhere near the spot where your generator is stored. You can even cover it as protection from dust and dirt. When you are embarking on an RV trip, you should fill up both your vehicle and generator fuel tanks. Perhaps your RV only has one tank to cater to both. In any case, get sufficient fuel and extra supply in a separate container for safety. Replace the tank of your fuel with a tightly secure lid to avoid potential leaks. Just like human beings, major devices such as an RV generator, need periodic maintenance checkups. Such practice will keep it in tip-top shape and prolong its lifespan. This way, minor issues are solved earlier before they turn into irreversible damages. This checkup is recommended thrice a year, and it’s best to keep a corresponding logbook for monitoring. Maintenance intervals are usually based on usage so consult your manual on these. Note that you don’t have to go to your manufacturer for servicing unless your unit is still within warranty. You can just go to your trusted repair shop to have a look at your generator’s condition. Humans are not built for a sedentary lifestyle – that’s why it is recommended for us to do regular exercises to maintain good health. The same goes for your generator. In fact, generators are designed to run for extended periods. So not using it in a while is not doing your unit any favor. Your unit should not be left idle for a long time because like us, they get sluggish and rusty. Generators need exercise, too, in the form of being powered on every now and then. If they skip on any activity for too long, its engine may encounter starting issues, over surging, or both. Even worse when there’s fuel left inside it. After a month, it can wreak havoc by messing with your generator parts. In order to avoid missing this routine, you should designate a particular day of the month in your personal calendar. When you exercise your generator, you should connect a few devices, or use a 50-percent load just for maintenance, and operate it for an hour or two. It is imperative you do this at least within a month of inactivity. This also heats up your generator windings and eradicates build up of moisture. Moreover, it lubricates engine seals and parts which help deter carbon accumulation inside. It’s good to be well-acquainted with your RV generator so you know how you can prevent small problems from turning into big and expensive headaches. Once you spot most of the following that you cannot handle yourself, inform your trained mechanic as soon as you can. Keep your old spark plug after you’ve gotten a new one for your gas-powered generator in case your current unit breaks down unexpectedly. Get a spare fuel filter, especially if you’re a frequent RV user. When you notice that your generator is not running as smoothly as it should, check the air filter and clean it to improve the situation. If you don’t clean or replace it regularly, it restricts airflow resulting in a richer fuel mixture. This causes premature wear and reduces fuel efficiency. See if there are leaks in your fuel lines, especially if it emits a fuel smell. Inspect your DC and AC wiring and advise your mechanic if you find any worn, loose, or torn connections. Change motor oil periodically as recommended by the manufacturer. Replace oil filter by following manual instructions, or ask a mechanic to do so. Maintain your coolant level and use only the suggested type by the manufacturer. Check your fuel supply as your generator may have bottomed out. Note that the fuel line will alert when it only has 25 percent fuel left. At this level, it won’t allow your generator to start as a safety precaution. Check your oil supply which has the same safety mechanism that will prompt the generator not to start if there’s only a quart left in its receptacle. Check your 12-volt power switch if it’s turned off. A built-in generator gets its starting power from a 12-volt battery setup. Check your fuel filter which may be clogged. This is common with diesel-powered generators. What do you mean by an RV-ready generator? An RV-ready generator is exactly what it is – a generator that is designed for your RV and will need simple installation procedures before operating. This type of unit already has a TT-30R outlet and has a sufficient power capacity for your onboard appliances. RV-ready also refers to its portability such that it’s easy to transport and carry whether you will need it outdoors, or in your rig. Which shops should I go to when purchasing an RV generator? Aside from RV specialty stores, you can get an RV generator at a local dealership when you already have a brand in mind. You might also be able to score good deals when you buy it online through Amazon, which offers a much wider range of RV generators. What other types of hardware do I need after I buy an RV generator? For starters, you’ll want to have an extension cord to enable you to store your generators a little further from the vehicle to diminish the noise level. Another would be an adapter to charge your USB devices for instance. While there are generators that have extra outlets, a common setup would be a single 12-volt DC outlet and two 110-volt AC outlet. When you want to use it to recharge your house battery, it is more efficient to connect to the AC outlet using a charge controller instead of plugging into the 12-volt DC outlet. Note that without this charge controller or the smart charger, make sure your generator is equipped to charge your type of batteries. Can the RV generator recharge a deep cycle battery? Yes, it can. Deep cycle batteries, which usually have 12 volts would require DC power most generators have as mentioned. However, your RV generator may not be able to meet the voltage and ampere requirements of your batteries. As such, it is best to have a charge controller when recharging a deep cycle battery using the RV generator. It will then be able to regulate the charge current, and fully recharge your battery in the quickest, most efficient manner. Alternatively, you can just plug your smart charger directly into the 110-volt AC output of your unit. Is it ok to keep the generator running during a drive? The answer is a definite yes. Your generator can be used whether you’re parked at a campground or while on the road. Your rig passengers can use the A/C unit to cool them inside during a hot summer day. For as long the generator is installed properly, you can use it regardless of the vehicle is moving or not. What is the lifespan of RV generators? All engines no matter how durable and premium their build is will have a limited lifespan. This is because any form of machinery is prone to encountering mechanical failures over time. Typically, a good quality generator can last up to 15 years, even more. Taking good care of it with periodic servicing will help you get the most out of your unit. Checking the running hours is crucial, especially if you consider getting a second-hand device. This way, you’ll get an idea of how much life you can still get out of it. What are surge watts and continuous watts? Both terms are named as described. Surge watts is the instant burst of energy that starts electric motors. Just like lighting a match where you need to get that initial spark to get fire. This is essential to get the generator running smoothly once it levels out to the continuous watts. This boost requires more wattage at the beginning. Surge watts are meant to be used for a few seconds at most. They are necessary every time you will turn on your generator. They also represent the maximum wattage of the generator. Continuous watts, on the other hand, is the power that a generator produces constantly which will be supplied to your electrical appliances. They will carry on until you turn the generator off. Which is the best fuel type for an RV generator? I have discussed this earlier, but for the sake of argument, I would say that you should follow the type of fuel you use for your towing vehicle. Aside from the explanation I have provided, this is also for simplicity sake and to avoid confusion. However, the bottom line is to always refer to your needs. To put it briefly, diesel is for heavy-duty use due to its fuel economy, liquid propane is for minimal power requirements, and anywhere in between, you should opt for gasoline. What prep should I need to with my RV generator before a scheduled trip? To make your RV travel hassle-free, it is essential to make sure everything is in order, including your generator. After all, your appliances will be of no use if there is no source of power for them to be functional. First and foremost, carbon dioxide must be present in your generator. This will entail you to check the exhaust system before using it. If this is damaged, you should never operate your unit. You should also see if the carbon monoxide indicator is working properly. For a portable generator, don’t forget to arrange its orientation when you arrive at the campsite such that it should not face the common area outside where other people hang around. What should I do if the built-in RV generator does not pump fuel? Assuming that your unit has been working prior, you should verify first if your fuel tank is more than a quarter full. This is an integrated safety feature that ensures sufficiency of fuel for the vehicle so it does not get used up by the generator. Also, check if you have two fuel filters, one below the carburetor and the other on the fuel line. There may be leaks coming from them. And while you’re at it, see if there are cracks along the fuel line, which may affect the pumping mechanism of the fuel from the tank.